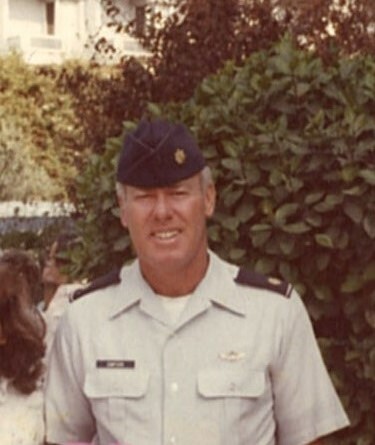 Maj. David S. Simpson, age 75, of Dallas, GA passed away Thursday, April 4, 2019. He was a loving son, father, grandpa, uncle, brother, and friend. David was an Academic Flight Instructor in the F-15 Eagle program at Tyndall AFB for 21 years. He was retired from the U.S. Air Force and flew over 100 combat missions in Southeast Asia. He graduated from the University of North Carolina at Chapel Hill with a Bachelor’s Degree and loved the Tar Heels. David also enjoyed traveling and playing guitar. He was quite the foodie and loved playing golf. He was also proud to be a Kubasaki High School Dragon in Okinawa, Japan. David is survived by his Stepfather CSM. John E. Kessling and wife Barbara, Stepmother Edith Simpson, Mother of his children Cherie Simpson, Son David Simpson of Trinidad, CA, Daughters Shanna Detweiler of Acworth, GA and Stephanie (Matt) Amos of Acworth, GA, Brothers Michael Simpson and Danny Simpson, Sister Rhonda Sinquefield, Grandchildren Emily Detweiler, Jacob Amos, Wesely Carmichael, and Wyatt Detweiler, and many nieces and nephews. He was preceded in death by his mother Dixie Kessling. Funeral Service will be held at Clark Funeral Home Chapel Monday, April 8, 2019 at 3:00PM. The family will receive friends Monday, April 8, 2019 1:00PM until 3:00PM. In lieu of flowers the family has requested donations in his honor to be made to the American Humane Society 1400 16th St NW Ste 360, Washington, DC 20036 or the Wounded Warrior Project PO Box 758517 Topeka, Kansas 66675-8517.